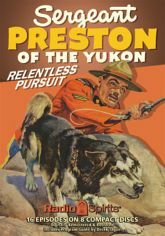 Plunge into the howling winds and freezing storms of the Great Northwest with Sergeant Preston of the Yukon and his fearless dog Yukon King! From WXYZ, the station that brought you The Lone Ranger and The Green Hornet, here comes Paul Sutton as the fearless crime-smasher of the Northwest Mounted Police in sixteen unforgettable radio adventures, including many presented here for the first time since their original broadcast! Includes a Program Guide by Derek Tague.